When walking or skiing near fast flowing water, I sometimes hear the jik-jik call note of the American Dipper. It’s a slate grey, robin-sized bird that resides year round in many of the streams in and around Mount Revelstoke and Glacier National Parks. John Muir described their song as “the music of the streams, refined and spiritualized.” Their post-feeding song is heard much less often than their call note, but is worth seeking out. While waiting for Dippers to sing (it could take a while, but mountain streams are especially pleasant places on a hot afternoon), they might entertain you with their territorial antics with neighbouring Dippers, as they defend prime stretches of creek habitat, or, with close formation courtship flights. Dippers get their name from their most conspicuous habit, a repetitive up-and-down bobbing motion, which is thought help them locate under-water prey from their position on a steamside rock. They feed by plunging into streams that flow fast enough that they would challenge my ability and courage to cross. They seek aquatic insects, like caddisfly and stonefly, and to a lesser extent, fish eggs. These Dipper delicacies only occur in pollution-free, well -oxygenated waters. 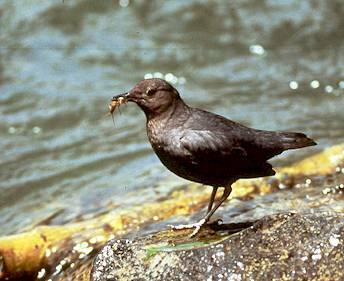 The presence of Dippers is a quick and reliable indicator of aquatic ecosystem health. However, water good enough for Dippers isn’t necessarily good enough for people to drink. The cleanest mountain stream can still harbor many kinds of micro-organisms (Giardia, Campylobacter, Cryptosporidium among others) that can effect human health. These are dealt with in municipal water treatment systems that cost millions of dollars, but far flung park facilities need a different approach. Illecillewaet River from the Skunk Cabbage Picnic Site in Mount Revelstoke National Park. This river and its tributaries are excellent dipper habitat. Backcountry users can’t rely on water treatment facilities. Fortunately, hiking trails in the parks are almost always upstream of human sources of water-borne contaminants. 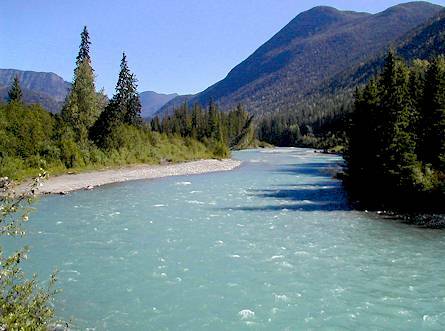 But parasites such as Giardia and Cryptosporidium can also be carried by wildlife, so it’s possible that, at times, any backcountry stream could be contaminated. The spring melt is when we are likely to find high coliform counts in the water as there is a natural flushing of water through the soil. We do have a few things going for us in the Columbia Mountains in terms of backcountry water quality. We do not have large concentrations wildlife. We have few backcountry areas heavily used by people. And we have great dilution due to our ample annual precipitation. Park water quality tests results before treatment in our facilities are good 99% of the time. Though there are many strains of Giardia, only some can cause human health problems and among people there’s a range of susceptibility to these organisms. To some extent our bodies adapt to the local fauna of our water. Often it’s visitors that experience intestinal discomfort from drinking water. Same for us when we travel abroad. While there is some risk, albeit small, to drinking wild waters, there are certainly problems if you don’t drink enough while out exerting yourself in warm weather. Dehydration will lead to headaches, cramps, or heat stroke. If you are concerned about drinking water from backcountry streams, here’s what you can do to improve your odds. Start out with water from home, by the time you finish that you’ll be beyond most sources of contamination. When filling up from a creek, avoid particulate matter. Prefer high elevation water sources such as a snowfields or glaciers. Some glacial waters have fine rock particles and are best left to settle overnight. If you want more security, then boil your water or purchase chlorine tables, iodine crystals, or a pump filter. We can all help backcountry water quality by disposing of human wastes and tissues in a shallow hole at least a 100 meters from any water source. When camping in a group, it is best to dig one adequate latrine than create many random holes. Cover the hole with dirt before leaving. Where fires are permitted, used toilet paper can be saved in a bag by the latrine and burned upon breaking camp. So the next time I’m waiting for the dippers to sing I’ll have a drink from the river, but only after I’ve considered what could be happening upstream.